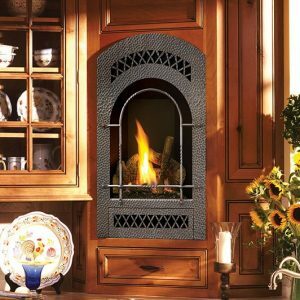 The Bed & Breakfast portrait-style gas fireplace is designed for intimate spaces such as bedrooms, baths and kitchens. With a 16,500 BTU maximum input this fireplace heats up to 650 square feet. The Bed & Breakfast features the award winning Ember-Fyre™ burner and 303 square inches of high quality, high clarity glass that comes standard with the 2015 ANSI-compliant invisible safety screen, increasing the overall safety of this unit for you and your family. The realistic flame along with the heat output, can be easily adjusted with our Comfort Control ™ gas valve which allows you to turn the gas input down 77%, so you can enjoy the ambiance of this fireplace year-round. This fireplace also features the GreenSmart® 2 Wall Mounted Remote Control, which gives you the ability to control virtually every function of this fireplace from the comfort of your couch. Burn Rate Range: Up to 16,500 BTUs/hr.